I have been helping businesses implement Customer Relationship Management (CRM) solutions for almost 20 years. I began in the days where "Sales Force Automation (SFA)" was the buzz-term and market leaders were GoldMine & Act. While a lot has changed in the CRM space over the years history repeats itself and that is happenning in the CRM space. The market went from SFA applications that were relatively inexpensive and packed full of features to CRM systems that were expensive, complex and in a lot of cases lacked depth of functionality. Unfortunately this prohibited many typically smaller businesses from tapping the power of CRM which is unfortunate. This is all changing... We are experts on Microsoft Dynamics CRM/365 so I will center my analysis on that platform. In the last few years Microsoft has poured innovation and investment into their Dynamics 365/CRM product. 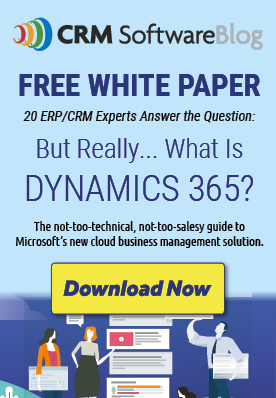 They brought a hosted Software as a Service version of Dynamics CRM to market (2013), they completely redesigned the user interface, added marketing, customer service, field service and project service automation components. Microsoft acquired LinkedIn and just this week announced the initial integration between LinkedIn and Dynamics 365. Last November Microsoft launched Dynamics 365, a platform that includes functionality across communication/collaboration, sales, marketing, customer service (CRM) and financials. They have enhanced the CRM platform by making things that were previously only achievable with custom programming available right in the admin tool (like calculated fields, rollup fields etc). What does all this mean for an SMB company who wants to tap the power of Dynamics 365? It means their cost will be lower, the ROI will be greater, the time to value will be shorter. The cost will be lower because the more functionality and increased configurability added to the product reduces or even eliminates the need for customization and custom development which are costly components of an implementation. It also reduces the total cost of ownership as customizations and custom development need to be maintained over time through system upgrades and changes to the business. At Strava we recognize this shift in the market and fully embrace the "configured CRM" approach to implementing the solution. For every client requirement we examine all the potential solutions and recommend the best approach including the cost/benefit ratio. Pay per user / month INCLUDING professional services. This allows a business to treat the entire project as opex, spreading out the investment over 3-5 years enabling the business to see real results and value without having to spend a large sum upfront. Fixed/low cost configured implementations - Leveraging the significant enhancements to the Dynamics 365 platform we are able to offer full implementations for a fraction of the cost even a year ago.